Robert P. Hegarty, formerly of Easton died in Needham on Jan 28, 2019. He was 87. Bob was born and raised in Reading and served in the US Air Force. He graduated from Stonehill College, where he played baseball and basketball and also coached basketball. He was inducted into the Stonehill College Hall of Fame. He taught history at Archbishop Williams High School in Braintree for more than 30 years. He also coached American Legion baseball in Easton and was an avid golfer. Bob was the beloved husband of the late Louise (McCarthy) Hegarty and the father of Colleen Hegarty and her partner Michael O’Grady of No. Attleborough and Patrick Hegarty and his wife Melissa of Needham. 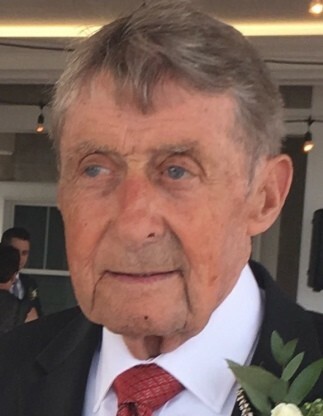 He is also survived by his grandchildren Jaclyn Rees and her husband Alex of Portsmouth NH, and Catherine, John and Michael Hegarty of Needham. Brother of the late Sr. Loretto Hegarty CSJ and John E. Hegarty. His Mass of Christian Burial will be celebrated on Fri Feb 1 at 10 AM in St. Joseph Church 1362 Highland Ave. Needham. Relatives and friends are kindly invited. Visiting hours in the Eaton Funeral Home 1351 Highland Ave Needham Thurs 4-7 PM. Interment private. In lieu of flowers, in recognition for the care Bob received, donations to Briarwood Healthcare 150 Lincoln St. Needham MA 02492 would be appreciated. Please note on check memo “In memory of Robert Hegarty”.